Rani Mukerji wrote, "It feels great to be 40. It feels great to have also worked for 22 years and having been incredibly lucky"
"It feels great to be 40. 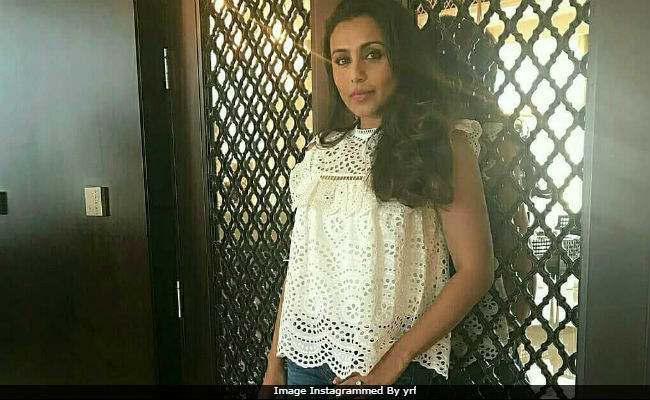 It feels great to have also worked for 22 years and having been incredibly lucky to get so much love and appreciation," reads the first few lines of Rani Mukerji's letter, posted by Yash Raj Films on social media. Rani, currently awaiting the release of Hichki, turns 40 today. In the first part of the letter, Rani has thanked the filmmakers for offering her diverse roles and later, she mentions the struggles a woman artiste has to face in the industry. "Very rarely do we artists get material that can genuinely cause social change, cause change in attitude and thinking and I have been fortunate enough to get such content multiple times. I truly feel blessed. I thank all the film-makers who have trusted me with their characters. Your characters, your films, became my identity," read an excerpt from Rani's letter. Addressing the stereotypes that prevail, especially for a married actress, she wrote, "As a woman, I must admit, it has not been an easy journey. I had to prove myself every day. Actresses have to prove themselves every day. A woman has a short career span, a married woman's equity dies, women are not bankable commodities at the box office, 'female-centric' (I hate this word!!) films are huge risks, a married actress who is also a mother is the final nail in the coffin of her dreams, ambitions and aspirations - these are some of the discriminatory stereotypes that we have to live with and try to overcome every single day." Rani Mukerji and filmmaker Aditya Chopra (he owns Yash Raj Films) married in 2014 and their daughter was born in 2015. Hichki, which releases this Friday, is Rani's first film after giving birth to Adira. "I have tried to take on this sexist stereotype by coming back to acting after my marriage and motherhood," she wrote. #RaniMukerji shares a heartfelt letter on her 40th birthday. In an interview with news agency IANS, Rani had said that she intends to treat her 40s like her 20s. "I want to treat my 40 as my 20. And I want to do a lot of work... More and more movies. I want to enjoy bringing up Adira. It is going to be the most important years of her life, so I think it's going to be a really, really nice decade," she said. Rani Mukerji is the star of films such as Black, Hum Tum, Veer-Zaara and Mardaani, her released film. Hichki is her first film in four years and releases on March 23.